Hiring Jaunty Twig for your wedding will add a very special extra dimension. 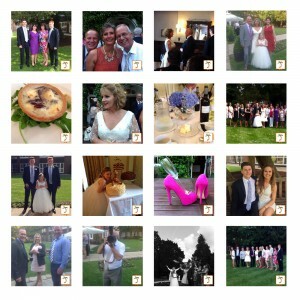 Originally written as a high tech replacement for disposable cameras, the Jaunty Twig wedding app is perfect for encouraging an unplugged wedding ceremony and provides your guests with a live focal point of shared images to a large screen. Your guests are also able to share their Jaunty Twig photos on their own social media, sign an electronic guestbook and record 10 second video messages too. All content is moderated so you can be confident the images displayed on the large screen is appropriate for all age groups. Unlike other hashtag feeds, post wedding you receive a complete copy of shared images, guestbook and video messages to use on your social media. We recommend a Jaunty Twig agent attends your wedding to manage the slideshow however, if you know someone up for the challenge, you can also run Jaunty Twig slideshow yourself!